Screen Printing Parties & Workshops in East Dulwich – We do Spin Painting too! Screen Printing/ Spin Painting Parties. Captured on the Rye is pleased to welcome you to one of our Screen-Printing and Spin Painting parties. Open to all ages 4+ for parties of up to *16 participants. 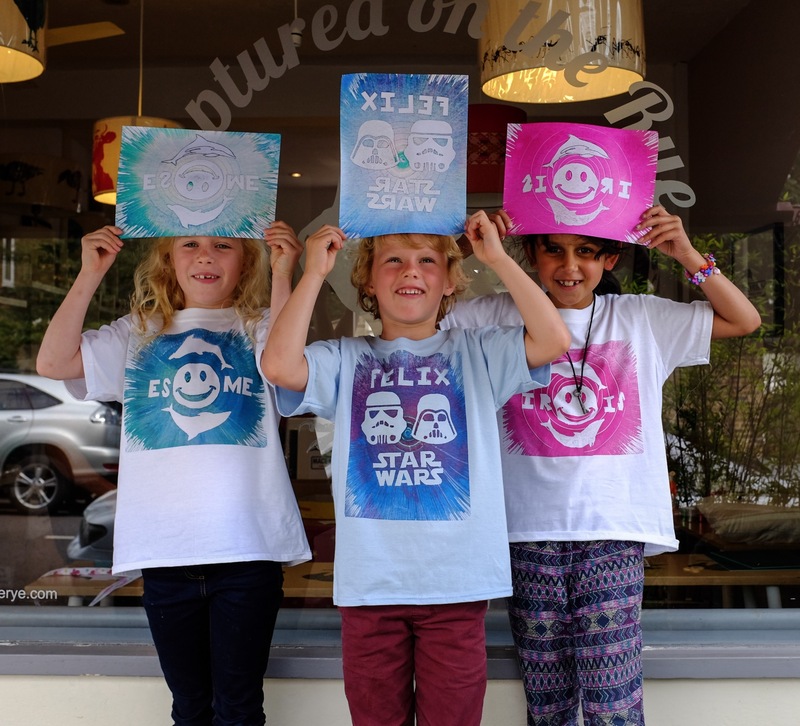 Come and work with Lou to design and print your own T-Shirt and/or make some fantastic spin-painted art creations. Perfect for birthday parties – especially if you choose to host the party at our premises so you don’t have to do any tidying up! You are welcome to bring your own party food, snacks, cake or you can order a pizza for delivery. Design your own tee shirt from your own imagination, or use one or more of our suitable templates or pre-cut stencils. Lou will work with each of the participants to develop their ideas and then print them onto a T-shirt using eco-friendly water-based inks which are colourfast and machine-washable. Results regularly exceed expectations, with participants able to proudly wear their own creations straight away if desired. Sessions must be booked in advance with a deposit of £200 paid at time of booking. After school Monday – Friday, Saturdays and Sundays are available as well as daytimes during holidays or for pre-school ages. We are happy to accommodate sessions for adults wishing an introduction to screen printing. These can be scheduled for evenings. Bring a bottle if you wish! If you would like to host a party at your home, or at a venue of your choice to accommodate a larger group, we can arrange that too. Prices are from £20 per participant inclusive of all materials, T-shirt etc. Please refer to our FAQ page to find answers to our most frequently asked questions. I will be happy to answer any more queries you may have. *We have squeezed in up to 18 guests more than once! We have combined our most popular activities to create these one-off masterpieces printed directly on to a tee shirt, tote bag or stretched canvas! In addition to a tee shirt, participants can also print a canvas shopping bag with the same design in the same colour. Add £5 pp. We have a candy floss machine available to raise the excitement even higher. Unlimited candy floss for all. Add £2 pp. Minimum spend £20. Hands in the air if you love your new t-shirts!